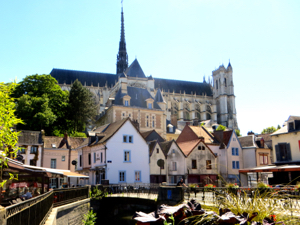 Amiens is a small city with a long history, interesting topography, and a gorgeous huge cathedral! 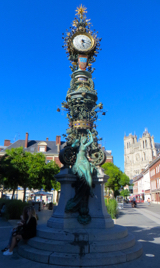 The historic center of Amiens is just a short walk from the train station and has a variety of pedestrian streets, restaurants and cafés, and interesting buildings. The major sites are all fairly close together and easily accessible on foot. The Musée de Picardie is a fine arts museum designed on the model of the Louvre in Paris. Its collection includes fine arts as well as archaeological collections from prehistory to more modern times. The museum is undergoing significant restoration work (un musée en chantier) and as of 2017 is closed until the work is completed. The lovely building was constructed between 1855 and 1867. In addition to these specific sites, the center of Amiens is a fun place to walk, and quite a bit of it is reserved for pedestrians. You'll see interesting sites such as the graceful clock tower, the large and ornate Hôtel de Ville (Town Hall), the shopping street Rue des Trois Cailloux, and the grassy Place Gambetta, with its fountain where children splash on hot summer days. Keep an eye out too for the Cirque Jules Verne, a large circus structure not far from the Maison Jules Verne. And of course there are lots of cafés where you can stop to enjoy a drink or a meal and rest your feet. Above, The Amiens Cathedral, seen from the Saint-Leu district.